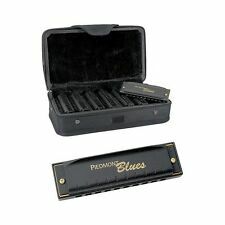 Fender Blues Deluxe Harmonica - Key of G , New! Hohner Comet 3427 Octave Harmonica C + G Germany! Hohner Comet 3427 Octave Harmonica C G Germany!. VERY GOOD USED SMOKE FREE COSMETIC CONDITION! PLAYS PERFECTLY! NOT CLEANED (I WILL LET THE NEW OWNER HAVE THE HONORS) PLEASE REFER TO ALL PHOTO'S AND JUDGE FOR YOURSELF! FREE SHIPPING WITH TRACKING! PAYMENT DUE IN 2 DAYS! Hohner Marine Band 1896 diatonic Blues harmonica Detailed Cleaned diatonic Blues harmonica in great condition with no box. The harmonica had been disassembled and Detailed Cleaned. You buy and you play and no need to worry about cleaning. Wholesale Lot of 24 Hohner Mini Harmonicas in Key of C Model 38-C -Really Plays! 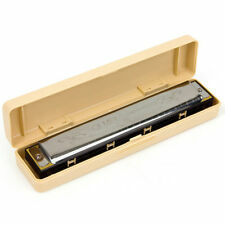 Hohner Mini Harmonica - smallest fully playable harmonica in the world. I even have zipper pull clip on mini harmonicas. 100% playable and makes a great gift. 5 out of 5 stars - Wholesale Lot of 24 Hohner Mini Harmonicas in Key of C Model 38-C -Really Plays! 1 product rating1 product ratings - Wholesale Lot of 24 Hohner Mini Harmonicas in Key of C Model 38-C -Really Plays! The plastic comb is in perfect condition, but the cover plates are with scratches(see pictures). The reed plates, the cover plates, the plastic comb had been detailed cleaned. All notes had been checked and make sure of correct strong and with beautiful sound. 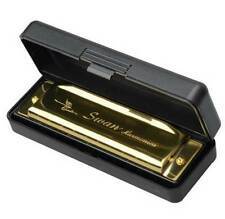 Specification Tremolo Harmonica (24 Hole, Key of C) Material Reeds: Phosphor Bronze Reed Plate: Brass Cover Plate: Stainless Steel Comb: ABS Finish: Black Nickel Net Weight: 6.17 oz Feature Phosphor Bronze Reeds Easy to blow and straw, well elastic performance and vibrate free. 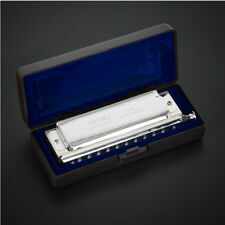 Superior Diatonic harmonica with aluminum comb. Cone-shaped lower coverplate for low keys (LF to LC) - minimized reed rattling in holes 1 and 2 draw. German silver reedplates. They're incredible. 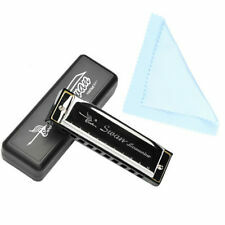 Hohner includes a Bb harp for playing cross-harp in the key of F—a favorite key of harmonica greats like Little Walter. Keys: G, A, Bb, C, D, E, and F (lowest to highest). New Gear: If you’re not satisfied, neither are we. Attractive 1950s look, with full length covers, closed at the sides. THIS HARP HAS TWENTY REEDS. Comb: Plastic; red. FACTORY SEALED NEW WITH CASE. Trending at $22.74eBay determines this price through a machine learned model of the product's sale prices within the last 90 days. Hohner Piedmont Blues. 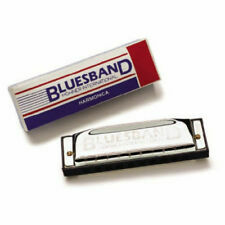 Throughout the history of Piedmont Blues, Hohner harmonicas have been found at the heart of this musical style in the hands of famous players like Sonny Terry, whose sophisticated sense of rhythm is still a marvel to behold.